Pignut, Conopodium majus, growing in dappled sunlight. Photo: Paul Kirtley. To the uninitiated, the pignut, Conopodium majus, can be hard to spot, particularly in the spring. But once you’ve been shown and know in which places to look, they are surprisingly common. Leaves appear in the spring, then the flowering heads in late spring and into summer. The plant flowers in late spring/early summer and once the flowering head dies back, the pignut leaves no above-ground sign of its presence. 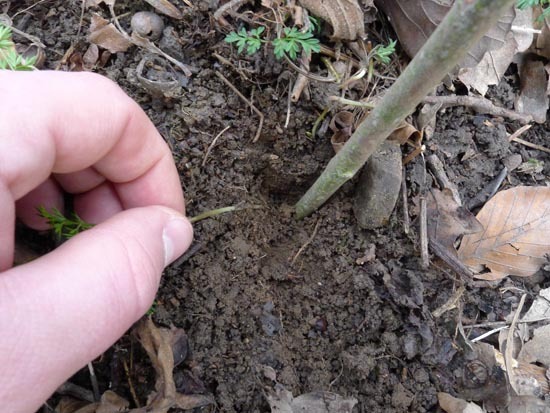 It is the underground part of the plant we are most interested in – the root or tuber – so the first opportunity you’ll have to gather them is in the early spring when you see the leaves appearing. Pignuts are one of the more palatable wild foods. The tuber can be eaten raw and is very tasty. In flavour and consistency pignuts are something like celery heart crossed with raw hazelnut or sweet chestnut and sometimes have a spicy aftertaste of the sort you get from radishes or watercress. Pignuts can also be added to soups and stews to increase carbohydrate content. There are records of pignuts – along with silverweed roots – being relied upon as caloric staples at times in the past. Therefore these diminutive roots could provide an important survival food even now. 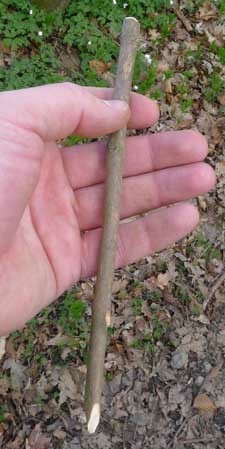 But even if you are not interested in survival skills, they are a great wild food for which to forage. 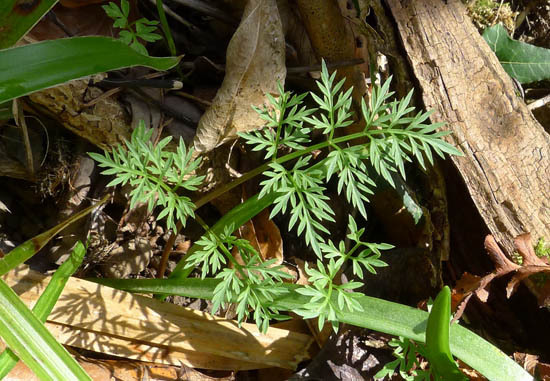 The pignut is in the carrot family, or apiaceae, and the leaves do bear some resemblance to carrot, at least in structure. As a general rule people should be wary of this family of plants as it contains some very poisonous plants such as Hemlock, Conium maculatum, and Hemlock Water Dropwort, Oenanthe crocata. The pignut is relatively easy to recognise from its above-ground or aerial parts, partly due to their small size compared to other members of the carrot family. The leaves are finely divided and delicate. The pignut is common in many parts of Europe and its range extends to North Africa. Pignuts grow in open woods and in well-established (and ungrazed) grassland. In the woods they like to grow in areas that receive a reasonable amount of sunlight. On bright spring days you’ll spot pignut leaves in areas of dappled sunlight, often right beside the trail you are walking along. The plant likes well-drained soil. You won’t find it growing in damp ground. Pignut, Conopodium majus, growing prolifically next to a woodland trail. Photo: Paul Kirtley. The most important edible part – the nutritious underground starchy tuber or ‘nut’ – is unlike other members of the family. 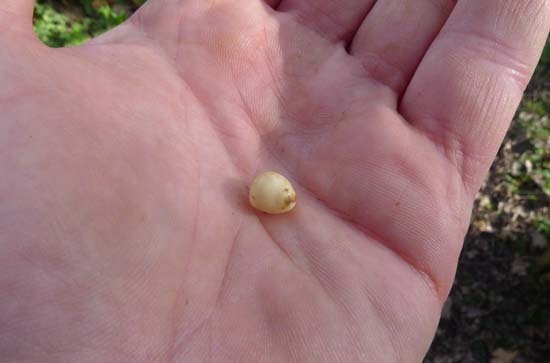 They are generally roughly spherical in shape and typically the size of a hazelnut but some specimens have been found as large as golf balls. The outer surface of the tuber is a similar maroon colour to a sweet chestnut although will be covered in soil when first removed from the ground. They can be smooth or sometimes a bit bumpy or warty-looking. Pignut, Conopodium majus, tuber with shoot. Straight from the ground. Photo: Paul Kirtley. 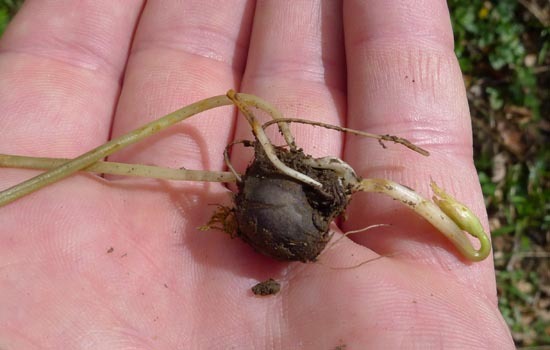 Apart from mistaking the aerial parts of the plant for other apiaceae in their early stage of growth, you should also avoid mistaking the underground part of the plant for other roots and tubers. Pignut leaves are often found shoulder-to-shoulder with bluebells, Hyancinthoides non-scripta, and so underground the pignut tuber is found near to the poisonous bluebell’s onion-like bulb. A badger expert once told me that many people observe badgers “eating bluebell bulbs” whereas in fact they are digging up and munching the pignuts which grow alongside. Studies have shown that pignuts constitute up to 5% of the diet of some badger populations. You can also find lesser celandine, Ranunculus ficaria, in the same areas as pignuts and while the roots of these are edible at certain times of the year (but ONLY COOKED), you don’t want to be making this mistake either. If you keep the leafy shoot of the pignut connected with the tuber then you have a positive identification. Achieving this, however, is quite fiddly. The tuber is typically 10-20cm under ground and the shoot gets thinner and thinner as you get closer to the tuber. It is very easy to break it and detach one from the other. Pulling the nut out of the ground by the shoot is out of the question. Also, the shoot tends to come out of the side of the tuber then bend at right angles to continue its journey upwards and out of the ground. So as you follow the shoot down to the tuber, this makes it harder to identify the tuber itself as it is rarely where you think it might be. Students on courses I have taught where we have collected pignuts have sometimes commented they were under the impression that collecting pignuts is illegal in the UK. I think this impression is given by some wild food books singling out the harvesting of pignuts as illegal whereas this is only part of the story. The relevant part of the Wildlife and Countryside Act, 1981 applies to all plants, not just pignuts. Unlike picking leaves from a plant, uprooting the plant itself is illegal without landowners permission, even if you are collecting for personal consumption. I would recommend anyone involved or interested in collecting wild foods in the UK to read and understand the BSBI’s Code of Conduct for the Conservation and Enjoyment of Wild Plants which gives a good overview not only of the relvant legislation but also ethical considerations. Find a small stick around pencil thickness, cut it to pencil-length and create a point at one end. Digging stick for a pignut, Conopodium majus. Photo: Paul Kirtley. 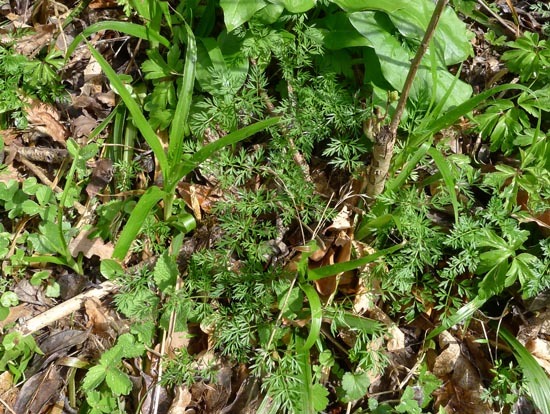 Clear the ground of leaves, etc around the pignut stem (don’t damage other plants though). Carefully follow the stem down into the ground by digging beside it with your stick. Don’t be ham-fisted; think lock-picking rather than digging. As you get deeper, the stem becomes thinner and more easily broken; at this stage, imagine you are defusing a bomb and can’t disturb the wires or, pehaps, a less stressful yet suitably fiddly job. Either the stem will appear to stop (if it bends away from the little hole you’ve dug) or you’ll dig down on top of the nut. Either way you should be able to see where the nut is. Now carefully dig out the nut and recover the whole tuber plus shoot in one piece. 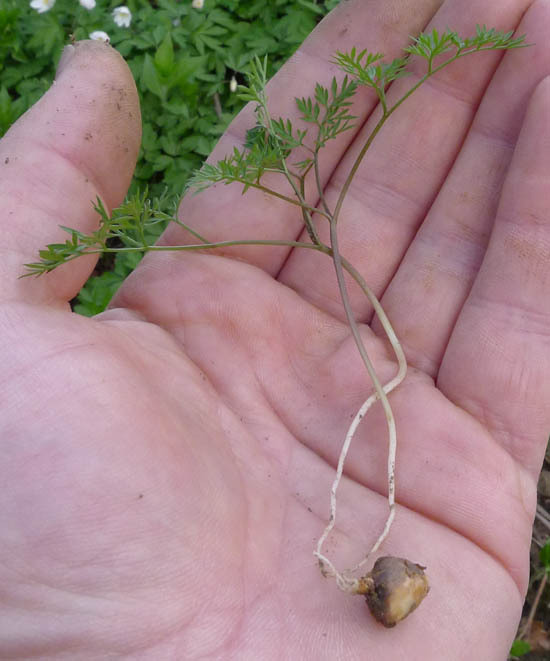 Keeping everything attached, with the tuber connected to the leafy shoot, allows for positive identification of the pignut, Conopodium majus. Photo: Paul Kirtley. Squeeze or scrape off the skin of the pignut, Conopodium majus. Photo: Paul Kirtley. 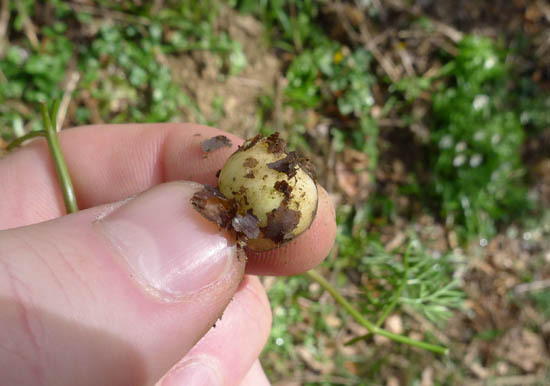 This small tuber of the pignut, Conopodium majus, is now ready to eat. Photo: Paul Kirtley. Great post- looking to get stuck in to a few when I return from France to go with my frozen frogslegs! Bonjour Nick! That’s an interesting food combination – let me know how it works…. 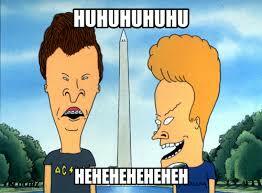 Like your article. Unfortunately the pignut is (very) rare here in The Netherlands. But I like to post, great pictures! Hi Joep, thanks. Glad you like the pictures! Hi Alison, oh yes I do remember your sorrel obsession 🙂 But in a good way. It’s always great to have people like yourself that take a special interest in something you are teaching. Some people say they find the flowering heads of pignut easier to spot later in the spring and into summer than the early leaves but you’re right, once you get your eye in you spot them everywhere. One thing that confuses people too is that the cauline leaves (growing from the stem) are different to the basal leaves (at the bottom). The latter also wither early. As for preservation – I’ve never tried to preserve them other than keeping them in a pocket for a few days when I was out in the woods – they dry out quite quickly. But I suppose (and this is just a supposition) that they might be quite good pickled, particularly if they maintained some of their crunch. Might be worth an experiement…. That’s the clearest guide I’ve read on this subject Paul. I’ll be keeping a good lookout in the woods now! Hi Dave, those are very kind words indeed! Good luck with your foraging. I may well try pickling them and maybe putting some in oil too. I wonder if they can be frozen. Could be interesting. As for the sorrel, guess who made sorrel tart just the other day with icing sugar and soured cream? :0) It was flippin’ delicious too. Let me know how you get on with the pignut preservation experiments. I might try pickling some myself if I get the chance. Hello Paul, thanks for a great article with some good clear pictures too. I have seen quite a few Pignut plants this year near me but as yet i have not dug for any,maybe this weekend i think ,thats if the local Badgers have not beaten me to it already. Hello again Paul, yes i managed to find a few Pignuts last weekend and quite tasty too,the badgers missed these. Incidentally i have found some new badger setts too of which i intend to do some observing some early evenings. Hi there Darren, good to hear that the badgers left you some pignuts and you managed to find them 🙂 Have fun watching the badgers – it’s a nice time of year for it. Great article Paul, thanks. I have heard about these little critters several times over the years but have never found a clear enough description or illustration to make a satisfactory i.d. Your photos of the plant in situ and your explanation of the process of harvesting is very, very helpful. Cheers. some great information there paul thanks,ive never come across pignuts before reading your blog.ive recently been out and since ive spotted my first one i was coming across them everywhere.I found most of them near blue bells. As Joep already mentioned, very rare, also it is protected in The Netherlands, it is on the “red list”. Very clear report on how to get this plant and where to get it. Found a bumper crop of Pig-nuts on my last foray to the woods! dug two to try, and they are lovely, very worth the little bit of effort it takes to find and dig out just for the taste alone.Many thanks Paul. Great to hear you managed to find some and munch on them. I think they are delicious too! Took a group of School children out to some local meadows two weeks ago, to ‘forage’ for Pignuts.The name itself fills the children with joyful anticipation.The process of hunting for them and then retrieving them is a skill in itself.The hour or so we spent doing this was very rewarding for one and all. Great pictures….. I am not sure whether I have enough patience to collect enough for a ‘Pignut broth’ ??? What a fantastic experience to give to a group of school children. Wonderful work you are doing…. I saw Pig Nuts on ” River Cottage” on TV and googled and found your info. Do you know if pig nuts are in NZ? We have many plants (weeds) brought here by the settlers. I would love to find pig nuts here, in NZ. Thanks for your info. I don’t know if Pignuts are found in NZ. I’ll see if I can find out for you. Can i chew on your pig nuts paul? hi paul,i can my grandad telling me about pig nuts when i was around 8,i showed all my mates how to dig for them on our school playing field,i still dig the odd one up now when walking our dogs,reading this bought back all my childhood memories,great photos and wording loved it…..
Hi Paul ,just been telling my son and granddaughter this week end just gone 28-11-16 ,how as kids we used to stay out all day long ,digging for pig nuts with small broken sticks with a sharp end ,tracing down the stems till we found the nut .just rubbing the skins off before eating them. we would have to be careful as butter cups would grow nr them, as they also have a bulb or tuber very close in appearance to pig nuts. Drinking from springs chewing on wild sorrel along with the tips of sprouting hawthorn foliage, elder berrys ,black berrys ,chestnuts, hazel nuts ,mushrooms ,light a fire and throw in a few potatoes to bake .and more .no money but a proper childhood . Seems like we had the same boyhood no money just great times. on the moors,kids today dont know what they are missing. Thank you for this very clear guide and photos. 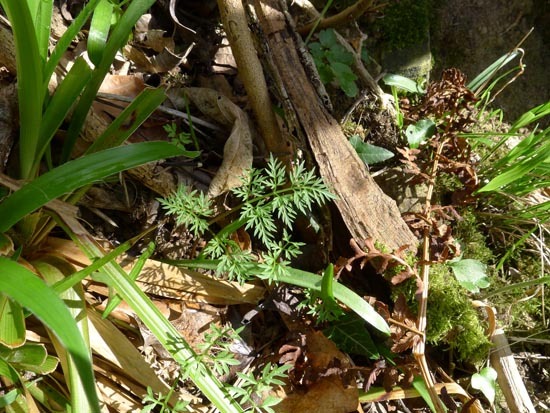 We went pignut hunting in our scrubby woodland at the weekend and found loads of the plants – we’d never noticed them before. Following your instructions we dug up a few of the tubers and they were delicious. Thanks again for opening our eyes a little more. I’m happy you let me know that I was of help. Thank you.